While 11 November is Remembrance Day for Canadians (and Armistice or Veterans Day in other countries), it’s St. Martin’s Day in Germany. St Martin’s Day is the feast day for Martin of Tours and was one last great banquet before the start of Advent fasting in the middle ages. 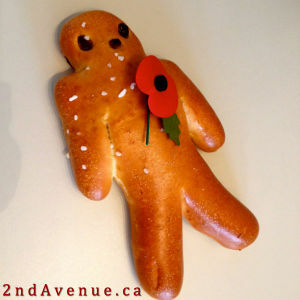 In modern Germany, St Martin’s Day is known for roast goose (Martinsgans), lantern processions, and, in Mannheim, human-shaped pastries called Martinsmann. We picked up a Martinsmann from our local bakery and were underwhelmed by its relative flavourlessness. Rather than waste the leftovers, I bumped them up with spices and apples in a bread pudding. This recipe is modified from one I use for leftover hot cross buns at Easter. It works best with sweeter bread, but would be just fine with regular bread, too, although maybe with a little more sugar. The bread pudding filled the kitchen with a lovely warm spicy smell, just like holiday baking – but it’s absolutely easier to make than gingerbread men or Christmas cookies 🙂 All the delicious smells with the ease of chopping up bread and stirring together milk, eggs, and spices! 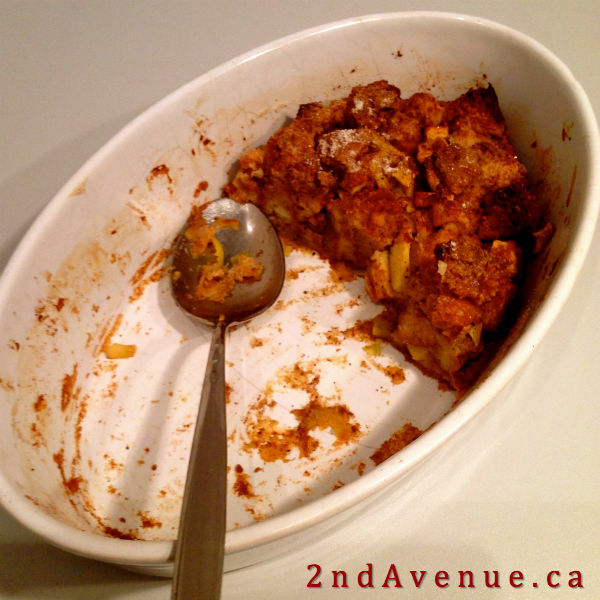 We ate this bread pudding plain, but it would also be good with ice cream, whipped cream, or bourbon/whiskey sauce. Adding chopped apple keeps everything moist and makes a sweet, buttery, boozy sauce unnecessary – although not any less welcome! And if you’re interested in the traditional Martinsgans, check out this roast goose recipe from Ginger & Bread. I haven’t had the St Martin’s pudding and I’ve been here for two years running now! 🙁 I feel cheated. Bakeries in Mannheim now seem to be selling the gingerbread-shaped Martinsmann as Weihnachtsmann, so there still the chance to make a post-Martinstag pudding!